Snowshoeing is a fabulous winter sport for all ages and one that is quickly gaining popularity. It’s easy to understand why. Virtually everyone can enjoy a snowshoe excursion in the brisk winter air, whether it’s a leisurely stroll or a hearty cardio workout. There’s no need for instruction and an easy sport to master; if you can walk you can snowshoe! There are incredible showshoe trails in and around Teton Springs Resort, or, simply blaze your own path. Head out in any direction from your cozy accommodations and the views promise to be staggering. It’s the perfect outing for family, friends and family to enjoy together and an optimum way to access the mountains year round. Slip into the backcountry for an afternoon tour; the Caribou-Targhee National Forest literally borders Teton Springs. Stay in a deluxe Winter Log Cabin or one of our beautiful lodge rooms or suites. 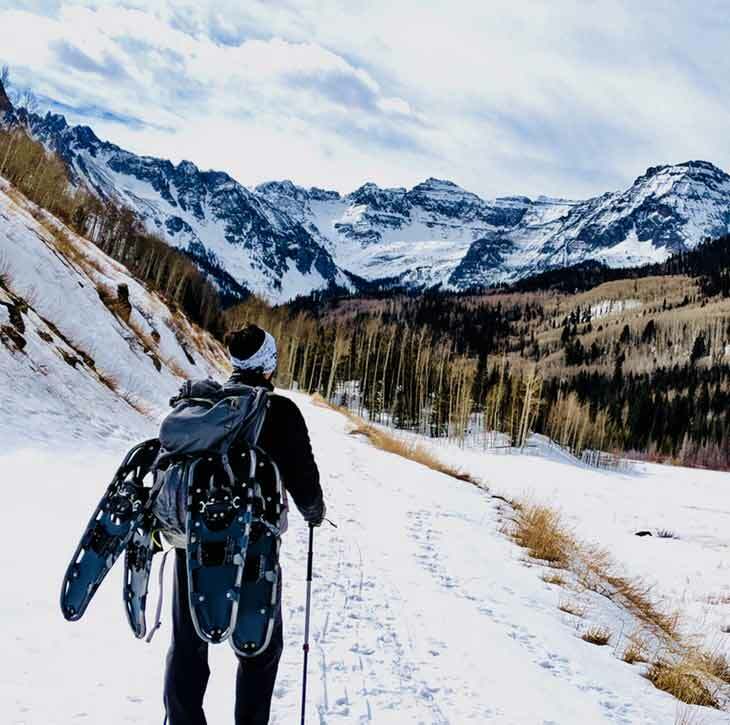 Our local partner, Teton Valley Trails and Pathways, is a terrific resource to finding the region’s extensive snowshoe trail system. Teton Springs accommodations are close to Targhee and Teton Village and both Wyoming areas offer miles of snowshoe trails. From Teton Springs it’s also a quick hop over to Jackson Hole and just minutes from this iconic western town is Grand Teton National Park. Free ranger guided snow shoe tours are offered daily (with $5.00 snowshoe rental). View wildlife in their natural environment and learn all about this magnificent ecosystem from the experts. Bring a camera; the Teton views on this tour are astonishing.